When you are looking for a little something sweet after dinner, skinny slices of frozen banana with a sprinkle of unsweetened cocoa powder are my go-to. 1) Cut and freeze: Cut 1 banana into 20 thin slices. Place them in a single layer in a plastic sandwich bag, freeze for at least 2 hours and keep in freezer for up to 3 months. 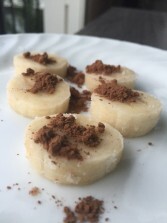 2) Spread and sprinkle: When you are ready to eat them, spread a teeny-tiny amount of almond butter (about 1/4 teaspoon) on each frozen banana piece and sprinkle with unsweetened cocoa powder, to taste. 3) Go EXTRA skinny: Omit the almond butter for just a straight chocolaty banana treat. Each slice is just 5 calories each! 4) Flavorize: You can use cinnamon or ground vanilla beans instead of cocoa powder. I do something similar, but instead of the almond butter, I add sliced almonds for an excellent crunch (it’s a different kind of crunch than adding crushed almonds for whatever reason). Try it! 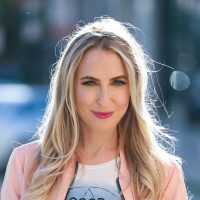 You really have made quite an impact with the Super Food Swap, since one of the things everyone did after the finale was run out to get the unsweetened coco powder. I have been to 3 stores and they were all out of it. Luckily I had cinnamon to put on the bananas and that took care of my dessert crave perfectly!